The Alabama Department of Conservation and Natural Resources (ADCNR) recently recognized four hunters for harvesting the largest alligators during the recent hunting season. The recognition is based on the weight and length of the harvested alligators as well as the hunting zones. A total of 250 tags were issued in three hunting zones this year and 158 were filled. Keith Fancher of Shelby, Ala., was recognized for harvesting the largest alligator in the west central zone, which is also the largest harvested since the regulated hunts began in 2006. His 838-pound alligator was 14 feet, 2 inches long. This zone, which was just opened to alligator hunting this year, includes Dallas, Wilcox and a portion of Monroe County. Two hunters tied for the largest alligator taken in the southeast zone. Both Jonathan Perkins of Collinsville, Ala., and Jeffery Scott Mann of Smiths, Ala., took gators that weighed 650 pounds and were 12 feet, 4 inches long. The southeast zone includes Barbour, Coffee, Covington, Dale, Geneva, Henry, Houston and Russell counties. John King of Spanish Fort, Ala., harvested a 12-foot, 7-inch alligator that weighed 593 pounds. 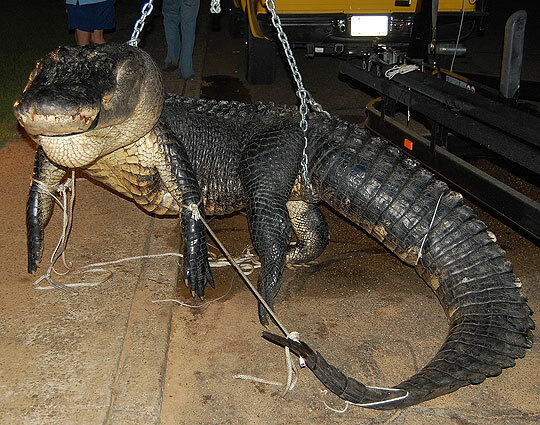 His alligator was the largest taken in the southwest zone, which includes Mobile and Baldwin counties. Restoration of the American alligator is a national conservation success story in which Alabama played a lead role. Unregulated alligator harvest throughout the South in the 1920s, ҆30s and ҆40s threatened the species with extinction. In 1938, Alabama took action and became the first state to protect them. Other states followed suit and in 1967, the U.S. Fish and Wildlife Service placed the American alligator on the Endangered Species List. Two decades of protection enabled the species to rebound. By 1987, it was removed from the Endangered Species List but retained as a federally protected species. Alabama's alligator population has grown to the extent that they pose a nuisance in many areas. Implementing a regulated alligator hunt on a small scale is an important step toward controlling populations and better managing this unique reptile. The Alabama Department of Conservation and Natural Resources promotes wise stewardship, management and enjoyment of Alabama’s natural resources through five divisions: Marine Police, Marine Resources, State Parks, State Lands, and Wildlife and Freshwater Fisheries. To learn more about ADCNR, visit www.OutdoorAlabama.com.